Kumbh Mela (the Urn Festival) is a Hindu pilgrimage that occurs four times every twelve years and rotates among four locations in India: Prayag (Allahabad), Haridwar, Ujjain and Nashik. Each twelve-year cycle includes one Maha Kumbh Mela (Great Kumbh Mela) at Prayag, which is attended by millions of people, making it one of the largest gatherings anywhere in the world (the other being the Muslim sacred pligrim Hajj). The major event of this festival is a ritual bath at the banks of the rivers in each town. Other activities include religious discussions, devotional singing, mass feeding of holy men and women and the poor, and religious assemblies where doctrines are debated and standardized. 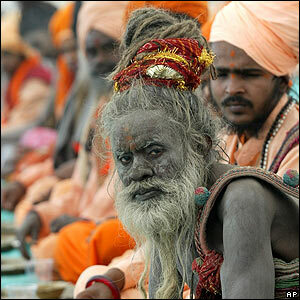 Kumbh Mela (especially the Maha Kumbh Mela) is the most sacred of all the Hindu pilgrimages. Thousands of holy men and women (monks, saints and sadhus) attend, and the auspiciousness of the festival is in part attributable to this.